The heat wave we experienced throughout this trip followed us to Amsterdam. Apparently yesterday’s temperatures were in the 90s — it certainly felt that way. After two hit summer vacations (Mediterranean and Japan), I was hoping for some cooler climes. So it goes, I guess. Today is the Gay Pride parade. Amsterdam is even more welcoming than San Francisco, with rainbow flags festooning everything. The city is packed, but the museums have been empty. My only bit of pique is that the rainbow image has been co-opted to become the symbol of a single special interest group. I think rainbows should belong to everyone. The Rijksmuseum is a great museum — and well-organized too. While the Hermitage was a bit of a disappointment (too much shlock, which is unsurprising when you think about the kitschy palaces), the Rijksmuseum was just fine. If you’re in Holland, visit the Rembrandt House, where you can see a meticulous recreation of his home in the building he occupied for almost 20 years after Saskia died. Anne Frank’s house has become a thriving industry since I saw it in 1980. The remodel is splendid in that it channels traffic skillfully so that every visitor gets a chance to walk through the Secret Annex. (Buy tickets online if you go there. The crowds waiting to get in are horrific.) The museum around the house focuses in tightly on Ann, her family, and her friends. It makes the Holocaust very personal but, by doing so, fails utterly to educate people about the Holocaust or fascism. At the end if the museum, there’s a room with very short videos, many of which are about special interest demands against a greater European culture that is not bowing to their dressing, immigration, or marriage requirements. The videos begin by focusing on a fictional young person with needs, and then, having personalized that need, gives a brief, shallow, fairly even-handed look at the issue, whether it’s veils in schools, forcing Christian civil servants to perform gay marriages, or allowing people to serve in the military while wearing religious garb. I’m homesick. My idea of a good trip is about two weeks. Being gone for 27 days drains me. Even a good trip — and this was good — can go on too long. Did you know that Anne Frank had been captured on film? A TV movie remake of The Diary of Anne Frank can be a very good thing. What sent shivers of fear up my spine about the latest version is the organization making the remake: the BBC. That can’t be a good thing can it? Most of the article about the upcoming show makes it sound as if people with normal minds have been in charge of the production. Instead of presenting Anne as a saint, which she was not, the show is going to present a high-spirited, “stroppy” teenager — which is very much the personality that comes through the pages, especially if you read the unexpurgated version of Anne’s diary. 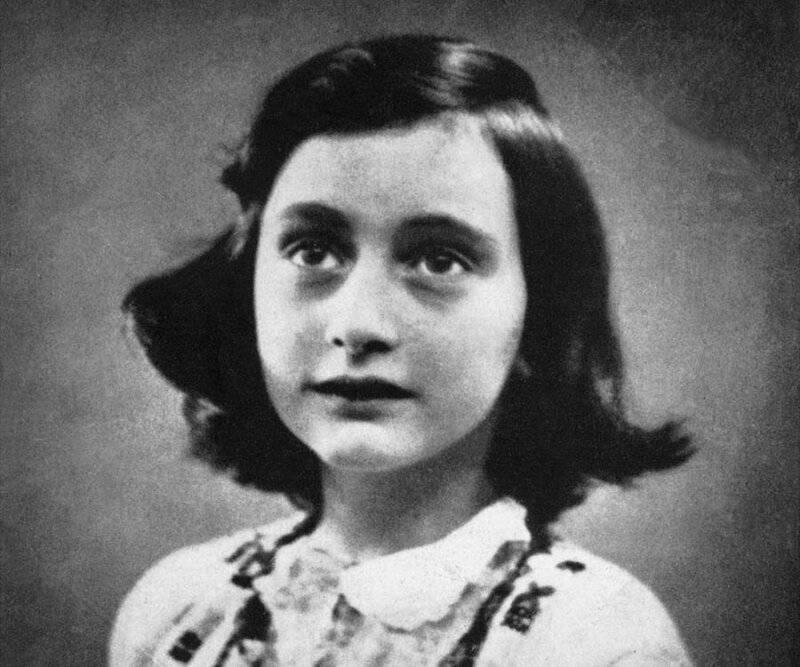 Anne was a real girl, and her sufferings, both in the sensory deprivation of the attic and in the horrors of Auschwitz and Bergen Belsen, happened to a real human being, not a plaster teen saint. After reading that stupidity, it is somehow unsurprising to learn that Moggach at one time lived in Pakistan. I suspect that, between England and Pakistan, her values system has been so perverted that she can no longer distinguish between good and evil. Moggach seems to live in a morally equivalent world that sees only bombs and victims. She lacks the ability to understand that sometimes good guys fire bombs and that sometimes bad guys are victims — and vice versa — and that you cannot equate people merely because each has had blood spilled. Reading Moggach’s self-written bio, she sounds like a charming woman, and one who tries to be open-minded. I just suspect that she’s so open-minded her brains might have fallen out. A few days ago, I posted about the rise in antisemitism around the world. One of my readers, who I know is a good and kind woman, decried this trend, but then said something interesting: “And now many Jews insist that we hate Muslims to support them. [snip.] [E]very anti-Islamic article posted makes it that much harder to side with the Jews. No one should be forced to side with one ethnicity over another.” In other words, if I understand her correctly, by bad-mouthing Muslims, Jews are making themselves look bad and are therefore less sympathetic. I’m actually happy to judge evil — because I know, with certainty, that I am not evil. That is, I don’t have to worry that, in judging others as evil, I might in turn be judged. I can cast rhetorical stones because, while I have my petty sins (I’m lazy, a bit hot-tempered, and I’m greedy when it comes to chocolate), I am not evil. The same holds true for Jews. As a group, they have the same foibles as the average run of citizens, but they are not, collectively, evil. They do not aim their guns intentionally at children, they do not use children to hide their own guns, and they do not revel in the deaths of children. Jews can judge those Muslims who got what they asked for (Gaza) and then launched more than 5,000 rockets into Israel, with the intent to kill civilians. Jews can judge those Muslims who have as their religious doctrine the requirement that the desired end of days be triggered, in part, by the slaughter of Jews. We are allowed to judge when we see evil. Thanks to those words, just about every Western school child learns that “people are truly good at heart.” I think it was that sweet sentiment that my reader had in the back of her mind when she left her comment. In that world view, if everyone is good, it does indeed lessen the virtue of one group of people if they imply that another group of people may not, in fact, be “truly good at heart.” The problem is that Anne Frank was completely and totally wrong. Before I get into the global wrongness of Anne’s position, it’s useful to understand the context in which Anne wrote those words, as well as to remember what happened to Anne within days of writing them. As Anne freely admited in the next sentence following her famous thought, she wrote those words because she needed to give meaning to a life spent in hiding and a world that had devolved into sadistic chaos. Anne was briefly reunited with two friends, Hanneli Goslar (named “Lies” in the diary) and Nanette Blitz, who both survived the war. They said that Anne, naked but for a piece of blanket, explained she was infested with lice and had thrown her clothes away. They described her as bald, emaciated and shivering but although ill herself, she told them that she was more concerned about Margot, whose illness seemed to be more severe. Goslar and Blitz did not see Margot who remained in her bunk, too weak to walk. Anne said they were alone as both of their parents were dead. Why am I emphasizing all this? Because I want to make it clear that Anne Frank was wrong. People are not innately good. Her words were whistling in the dark, written to give herself faith and courage under terrible circumstances. They cannot and should not be used as a yardstick for measuring human being’s natural state. And for Liberals to cling to this “ideology” moves beyond optimism into self-destruction. Anyone who has children knows that, while they have a tremendous capacity for love, and have within them the seeds for reason and kindness, their innate state is more Lord of the Flies than anything else. Children are naturally violent, greedy and jealous. What tempers children is a society’s externally imposed value system. And these value systems don’t spring out of whole cloth. They are the results of centuries of give and take, violence, refining, and thought. In a chauvinistic way that I’m not even going to bother to defend, I think our modern Judeo-Christian value system is one of the best ever created — and it’s not innate, it’s learned. I’ll go even further here: I don’t like the current fundamentalist Islamic value system, with its denigration of women, Jews, and non-Muslims, and its obsession with visiting extreme physical violence (and I include beheading and other slaughters) on those so denigrated. I don’t think we in the West are innately good, or that those in the fundamentalist Islamic Middle East are inherently bad. I do think, however, that we have the better value system, and that it’s terribly dangerous for people to put their faith in Anne Frank’s touching but misguided words about humans’ innate goodness. Worse, this is not merely the misguided approach of a single good and kind person. Instead, a vast portion of the American population has bought into a teenage girls’ “whistling in the dark” musings and now tries to impose this naive view on American (and Israeli) foreign policy, hampering those countries’ ability to protect themselves against those whose value system calls for its enemies subjugation and death.